When you’re working, it’s easy to stave off those midday hunger pangs with a bland bite to eat – there’s a reason why desk lunches have their own hashtag. But if you work in London – especially if your office is located in a foodie district like Camden – you’ve got so many lunch options that it seems a shame to stick to sandwiches every day. So if you fancy treating yourself to something a little bit special, why not head to one of these unique Camden eateries instead? LABS member? You’re in luck! They’re all just a short stroll away from the office. The Market’s one of the things that’s made Camden the must-visit destination it is today. Famous for its food stalls, you’ll find dishes from all around the world here, hidden amongst its cobbled, labyrinthine passageways. Whether you’re after some grab ‘n go street food or a sit-down meal, there’s plenty to choose from. The best way to enjoy the Market’s food offering is to wander around and see what you come across; you’ll no doubt discover something new along the way. 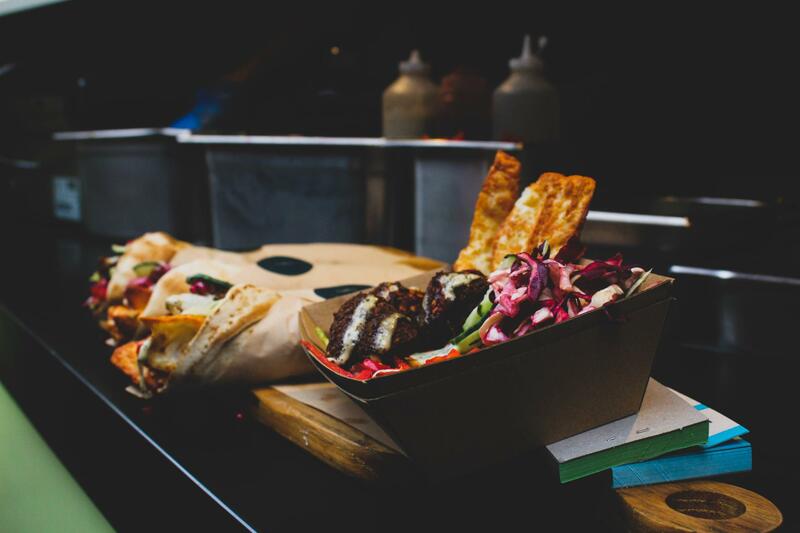 If it’s unlikely that you’ll have the time to properly explore the Market, we suggest you make a beeline for Ladle (where you’ll find international curries, stews and soups – all served by the ladle) or Zala Grill(a Middle Eastern eatery serving up traditional dishes that are choc-full of flavour). Also on the list is Kim’s Vietnamese Hut, winner of the 2018 Camden Inspire award for ‘Best Eating Experience,’ and Yaki Box (for the best katsu of your life – seriously). For a vegan twist on a London classic, head to Young Vegans in Camden Lock Place; they’ve been serving up delicious vegan pie and mash (with gluten-free options) since 2016. And if you’re a meat-eater, STAKEHaus is where it’s at; get perfectly cooked steak and chips (and a good dollop of STAKEHaus’ secret sauce) for a protein-packed lunch that’ll set you up for the gym later on. And remember, you can get a discount at food stalls in Camden Market just by flashing your LABS pass – even better! You can’t talk about food and drink in Camden without mentioning a pub or two. And though not every single one of them serves food at lunchtime, a good handful of them do. One such place is The Spread Eagle; a cosy Victorian-style gastro pub located just off Camden High Street, headed towards Regent’s Park. Less than 10 minutes on foot from LABS Triangle and the Atrium, The Spread Eagle has a rustic vibe that’s perfectly in-keeping with their hearty seasonal dishes. If you’re looking for a lighter lunchtime bite, their brunch menu comes up trumps. Food is served from 12pm daily, and it’s generally fairly quiet during this time, so it’s an ideal spot if you need to get back to the office within the hour. If you’re looking for a vegan-friendly place to grab lunch, head to Mildreds. With three other restaurants dotted around the capital (in Soho, King’s Cross and Dalston), Mildreds has become a go-to for Londoners who’re following a plant-based diet. Situated just 3 minutes from Camden Town underground station, the restaurant is housed in a spacious glass-fronted building just off the high street. Inside, the mid-century modern décor keeps the place feeling fresh and on-trend; much like the menu. If you’re looking for vegan and vegetarian fare done differently, you’ll find it here. And even if you’re the type to choose rump steak over a nut roast, you’ll still find something to get your teeth into at Mildreds; their expansive and internationally-inspired dishes aren’t to be scoffed at. You can even order food to go; now that’s one way to liven up your #desklunch. You can find Greek food in abundance in Camden, and Andy’s has amassed quite a following thanks to its authentic food and ambience. Since opening in 1967, this honest little eatery has become one of Camden’s best-loved institutions. With it’s white-fronted façade and relaxed interior, Andy’s has become famous for serving up delicious Greek food at pocket-friendly prices – with friendly staff to boot. It’s one of those gems that people stumble upon, love, and then keep going back to. And with their set lunch menu (which is available from 12-12.30pm), you can get a three course meal for £9.50, or two courses for £6.95 – the perfect penny-saving option for a post-work pint! If rainy days are getting you down, Ma Petite Jamaica offers a taste of the Caribbean – in Camden. As London’s first Caribbean diner – it’s been serving traditional Jamaican food in the capital since 1985 – you’d expect something special, and it certainly delivers. On entering, you’re met with bold, tropical décor and waiting staff in shirts that are as colourful as the walls. And that’s just the start. Serving classic Caribbean mains like curried goat and jerk chicken, as well as more unique dishes you’re not likely to get at any old chain restaurant (you’ve got to try the ackee and saltfish dumplings), it’s the perfect place to while away an hour. And if you want to come back in the evenings, they serve killer cocktails too. Sometimes, only a London caf will do. And Mario’s Café on Kelly Street is a quintessential London caf. Loved by locals and made famous by the band Saint Etienne (whose eponymous 1993 single surely brought in a few more regulars), Mario’s is compact and cosy – and one of the friendliest cafés in the city. Local artworks hang on the walls and the Formica tables host a variety of sauce bottles. It’s just what you want when you’re ordering a full English from a family-run venture. If filling up on sausage, bacon and eggs on a weekday isn’t your thing though, there are plenty of other options available. There’s also a choice selection of Italian dishes, owing to Mario’s continental roots; you’ll find homemade and hearty pasta meals, as well as light bites and pastries. Mario’s is up towards Kentish Town West station, which is a 10-minute walk or so from LABS, so you’ll have plenty of time to enjoy a lovely lunch and a natter with the locals. Like we said, it’s a friendly place. And remember, you can find and order food from nearby with the Camden Eats app. You can order ahead (which is ideal if your calendar’s packed) and split the delivery bill too – so you and your colleagues can all enjoy tastier lunches! You’ll save money and get access to exclusive deals – all without waiting in line. Head to the app store to download it now.